Buying a home while selling a home and trying to close at the same time is difficult in just about any market. It's not just a matter of logistics and coordination, although that is part of the difficulty. It's also difficult because, to close concurrently, somebody is taking a risk, and often that somebody is the seller of your new home. The first thing you can do to understand this concept a little better is to take off your seller's hat and put on your buyer's hat. Home buying in a seller's market carries its share of frustrations and complexities. Just for a moment, think about what happens in a seller's market. Inventory Is Low: Typically, there are fewer homes for sale in a seller's market than the number you will find in a buyer's market. Fewer homes mean there are not enough homes, generally, for every buyer who wants to buy a home. You might not be able to find a home that is suitable for you. Multiple Offers: In a seller's market, it is very common for a buyer to be competing with other buyers who want to buy the same home. The seller could have many offers to choose from and may rank them according to desirability. A buyer who has not yet sold his home is not a desirable buyer when pitted against a buyer who has no home to sell. Contingent Offers: A contingent offer is still a contingent offer even if your home is in escrow, waiting to close. Because you need the money from the closing to buy your new home. If it doesn't close, you can't perform. If your home is not on the market at all, it shows the seller you are not serious about selling and you have almost a zero chance that the seller would take your offer. Buying a Home First: You have options available to you. It is not a dead-end street. If you can afford to own both homes at the same time, and a lender will qualify you, you might want to go ahead and find the home that you want to buy first. Part of qualifying to own two homes could involve showing that you have six months of payments for both homes in the bank. Apart from showing that you can qualify to own two homes at the same time, you will also need the money for a down payment and closing costs. You can borrow the money or tap a savings account and most likely be at little risk for repayment, as long as a seller's market still exists when you are ready to sell. It is almost always preferable to have access to the funds without incurring additional risk. So if it's a choice between using funds on hand or borrowing, you should probably use your funds on hand. Renting Back After Selling Your Home: Only in a seller's market is this option a good one. It's not impossible to do in a buyer's market, but if there is any time that you can ask a buyer to let you rent back for 30 to 60 days after closing, it is in a seller's market. This would give you time to not only locate another home but time for a few offer rejections as well. At this point, you would have no contingent offer on selling your home because it is already sold. No Contingency to Sell: Once your home is ready to close, you might be able to delay the closing and write an offer to buy without a contingency to sell. When the buyer for the home you are selling is approved by the underwriter, you can be relatively assured that the buyer will perform. If you are confident the buyer can perform, you could delay the closing to close concurrently with the date you close on your new home, providing the buyer will wait. If a buyer was ever going to wait another 30 or 60 days to close, a seller's market is that time. The risk to you is if the buyer does not close, you could still be obligated to close on the home you are buying. Selling First and Buying Second: This option is probably the least stressful because there is less at risk than with any of the other options. The benefits are you will know exactly how much money you will net from the sale because it has closed. The drawback is you will have to move out of the home at closing. Some people put all of their belongings in a POD or a storage rental while they stay at a hotel or move back home for a while. 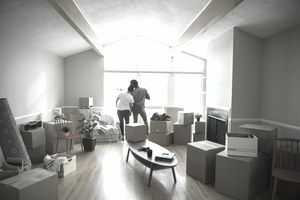 Alternately, some people will rent a new place on a 30-day month-to-month rental agreement, which gives them flexibility as to when they will move. But no matter how you look at it, you still need to move twice with this option. All of these options do not take into consideration the fact that you could get lucky. You could find a seller who is willing to take a contingent offer and wait while you sell your home. But in a seller's market, those odds are against you.